Create inspiring and delicious cocktails using two superb spirits. 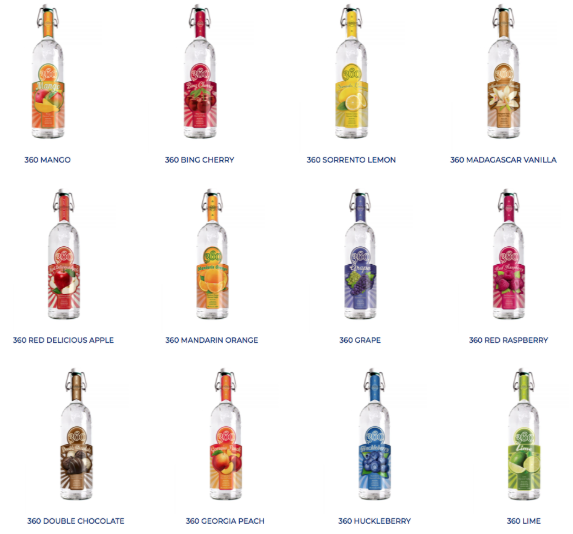 The series of 360 Vodkas available in twelve decadent flavors including a focus today on the popular 360 Double Chocolate Vodka. 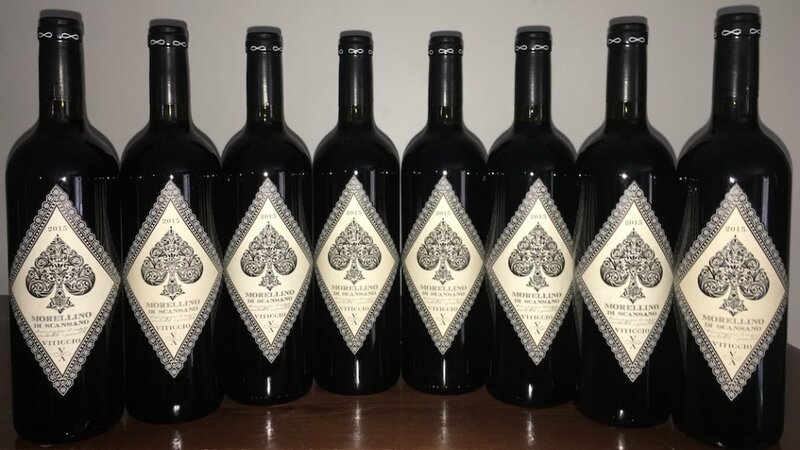 The 360 Eco Luxury Chocolate Vodka, LCBO # 396671, $16.90 per 375 ml bottle is a six times distilled vodka made with eco awareness and corporate responsibility. 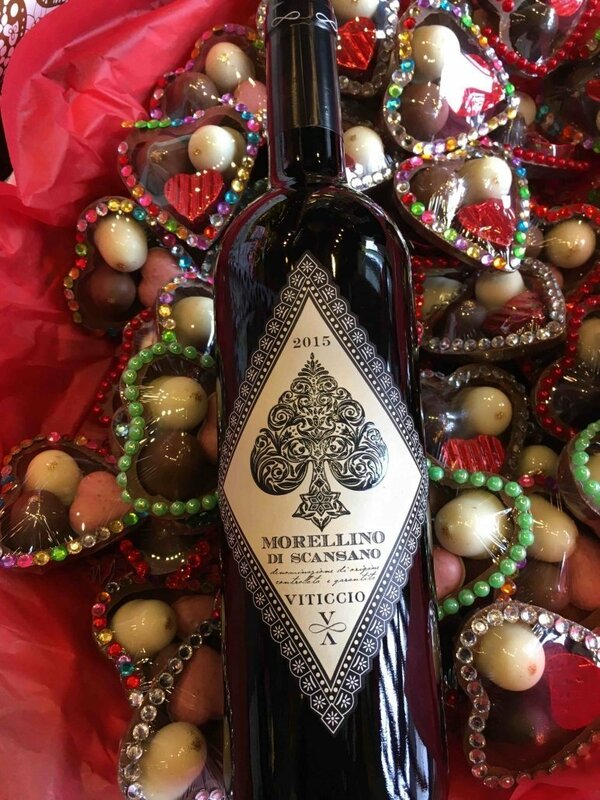 It’s chocolate just like you want it… deep, dark and deliciously seductive. 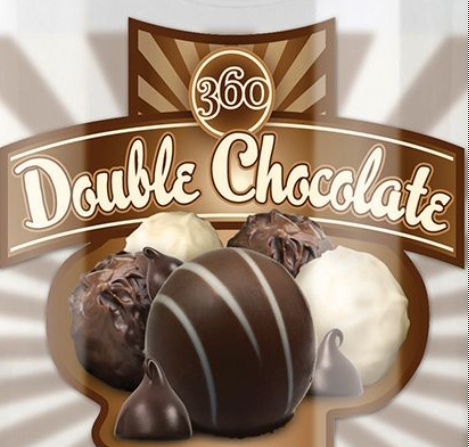 That’s the irresistible result of pairing smooth 360 Vodka with a double dose rich and creamy Chocolate. 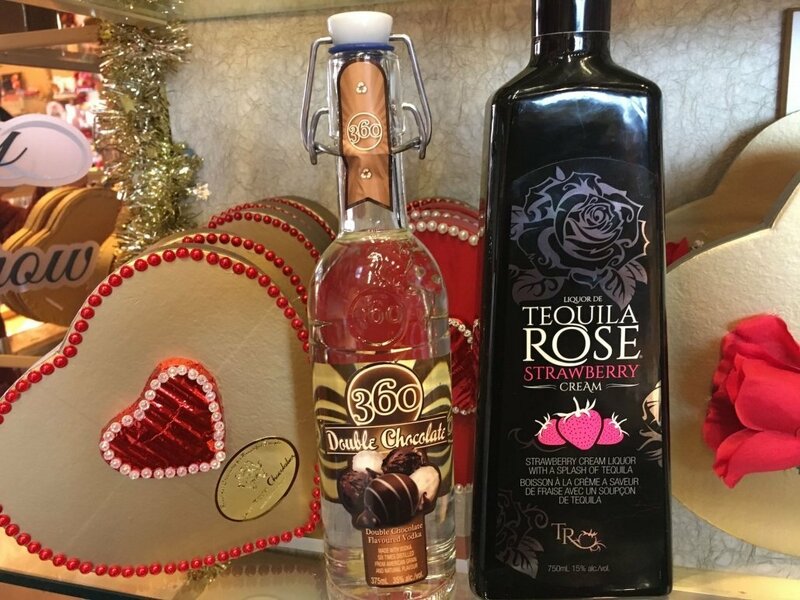 And completing the cocktails, a daring alternative…the Tequila Rose Strawberry Cream, LCBO# 382747, $29.95 per 750 ml bottle the original strawberry cream liqueur! 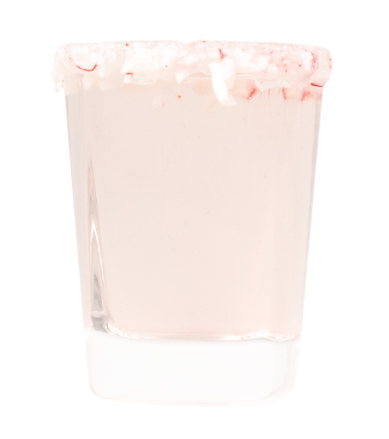 Combining strawberry cream with tequila…exotic, unexpected and delicious! 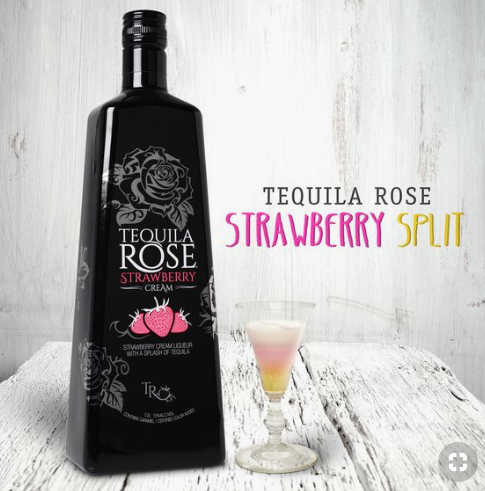 Over twenty years later, Tequila Rose Strawberrhttps://tequilarose.comy Cream remains the world’s best-selling strawberry cream liqueur and was the inspiration that paved the way for the unique cream liqueurs that have followed. 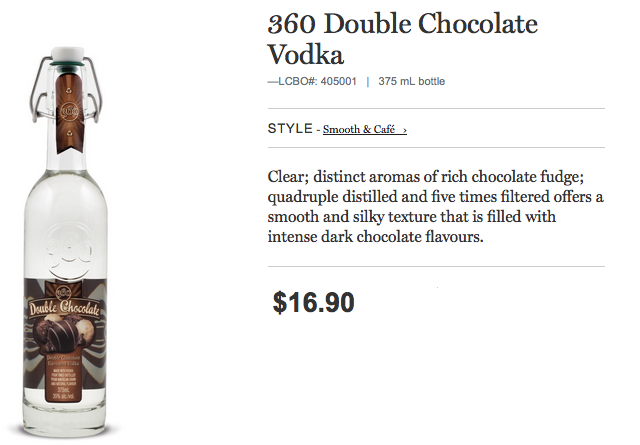 BRANDS: 360 Double Chocolate Vodka. 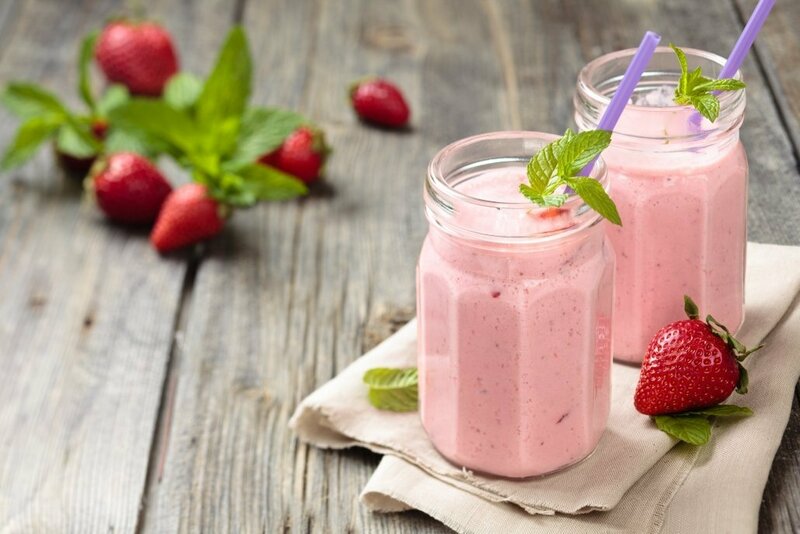 Tequila Rose Strawberry Cream Liqueur. INGREDIENTS: 0.5 oz Tequila Rose. 0.5 oz Banana Liqueur. 0.5 oz 360 Double Chocolate Vodka. INSTRUCTIONS: Layer in a shot glass. 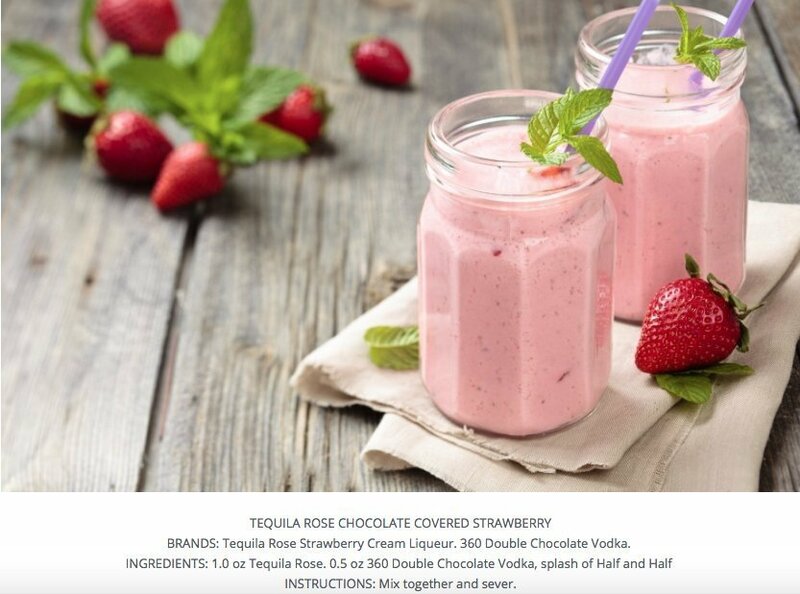 BRANDS: Tequila Rose Strawberry Cream Liqueur. 360 Double Chocolate Vodka. INSTRUCTIONS: Mix together and sever. BRANDS: 360 Red Raspberry Vodka. 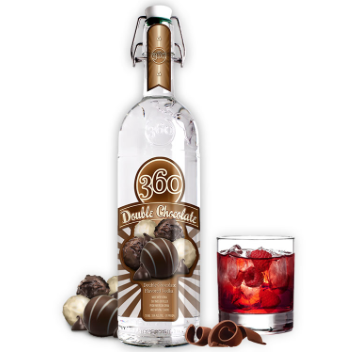 360 Double Chocolate Vodka. 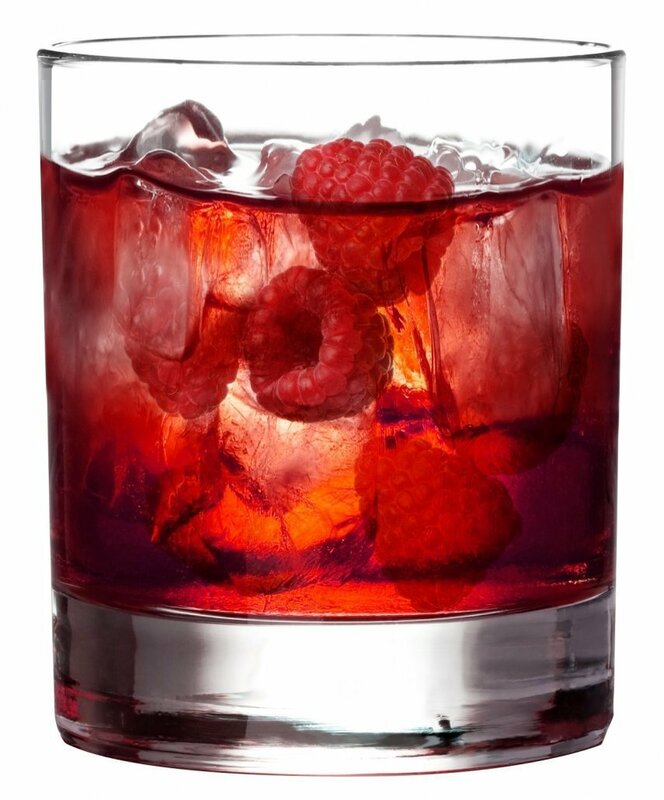 INGREDIENTS: 1.0 oz 360 Red Raspberry Vodka. 1.0 oz 360 Double Chocolate Vodka. 0.5 oz Simple Syrup. 3 Raspberries. 1.0 oz Sour Mix. 0.25 oz Raspberry Liqueur. INSTRUCTIONS: Shake and strain. Splash with lemon lime soda on top. INSTRUCTIONS: Mix ingredients in glass with ice and top with Cola and cream. INGREDIENTS: 2.0 oz 360 Mandarin Orange Vodka, 0.5 oz OJ., 0.5 oz Agave Nectar, 0.5 oz 360 Double Chocolate Vodka, Chocolate syrup for drizzle. 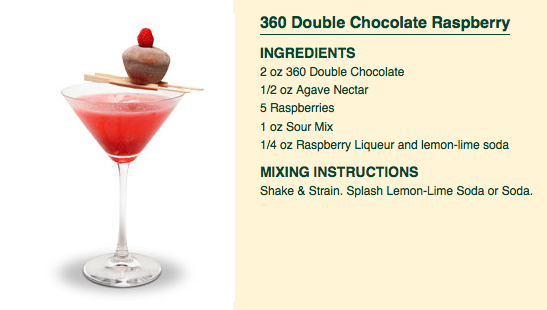 INSTRUCTIONS: Add ingredients shake with ice and strain into martini glass that has been drizzled with chocolate syrup. 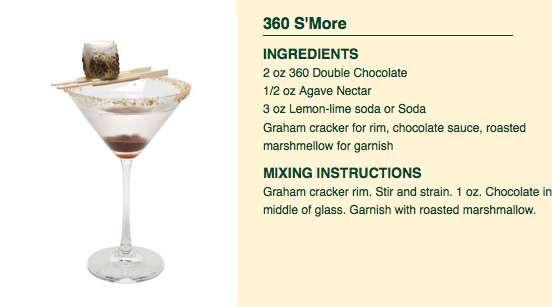 INGREDIENTS: 0.5 oz Agave Nectar 3.0 oz Lemon Lime Soda 1.0 oz Chocolate Syrup Graham Cracker for rim. INSTRUCTIONS: Rim a martini glass with graham cracker rim. 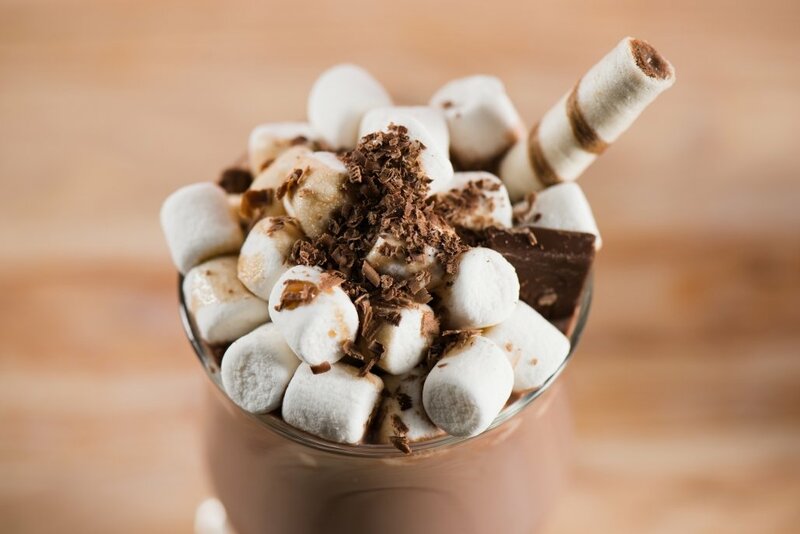 Drizzle 1.0 oz chocolate syrup in glass. 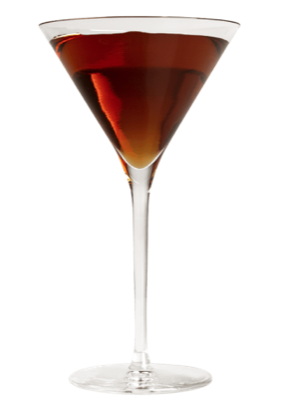 Mix ingredients together and strain into a martini glass. Garnish with a roasted marshmallow. 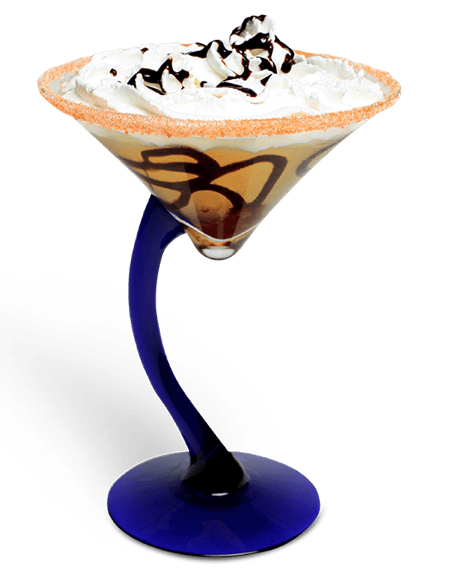 INGREDIENTS: 2.0 oz 360 Double Chocolate Vodka, 0.5 oz Peppermint Schnapps, 0.5 oz McCormick Irish Cream. 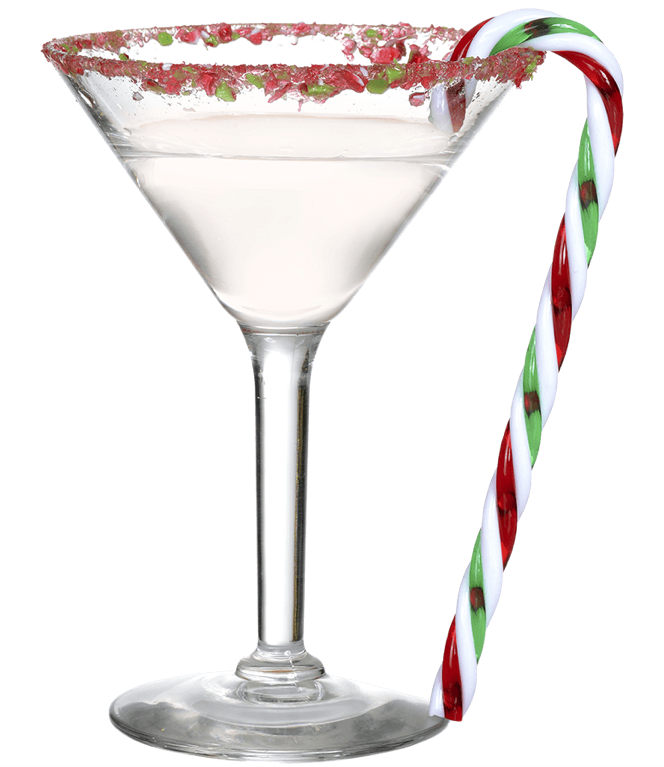 INSTRUCTIONS: Shake and serve up with a candy cane. 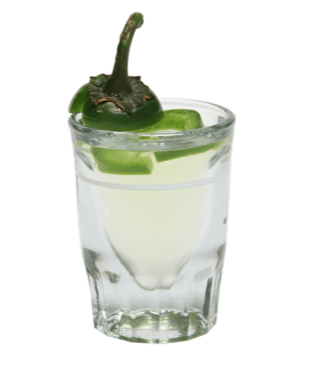 INSTRUCTIONS: Muddle Jalapeño Pepper slices. Add ingredients. Fill with ice. Shake/Strain. INSTRUCTIONS: Shake over ice and serve in a chilled martini glass. 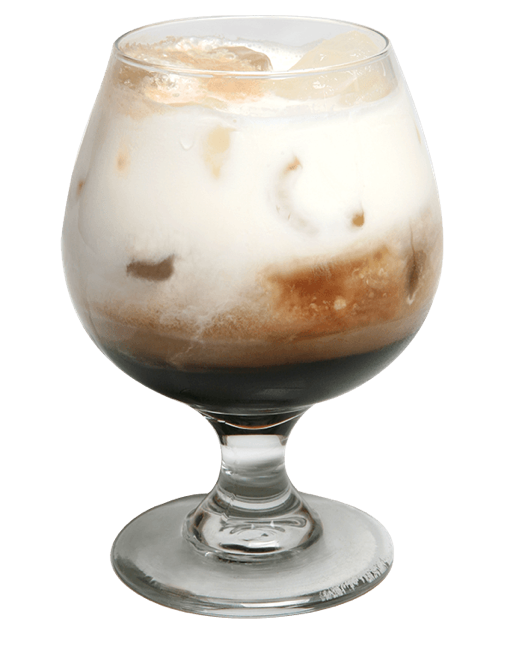 BRANDS: 360 Double Chocolate Vodka, McCormick Irish Cream Liqueur INGREDIENTS: 2.0 oz 360 Double Chocolate,0.5 oz Coffee Liqueur. 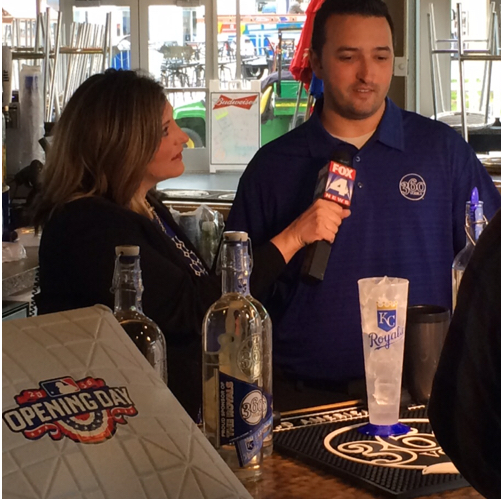 INSTRUCTIONS: Shake ingredients with ice in a shaker and strain into a martini glass. 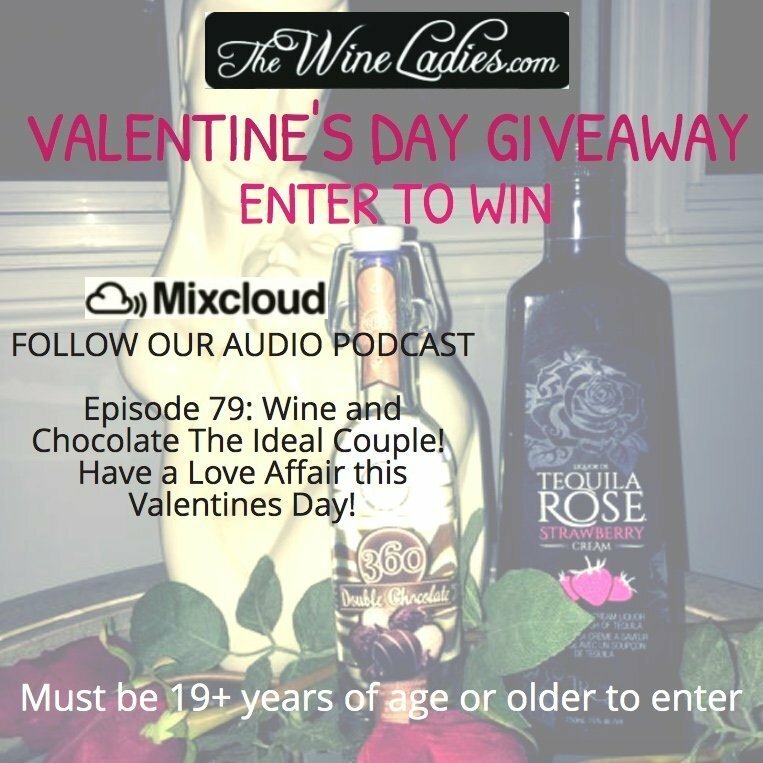 Still time to enter to win!!! Contest closes Monday, Feb 3rd at noon! We are always on the look out for something new and exciting! We recently discovered an absolutely decadent, delicious spirit. 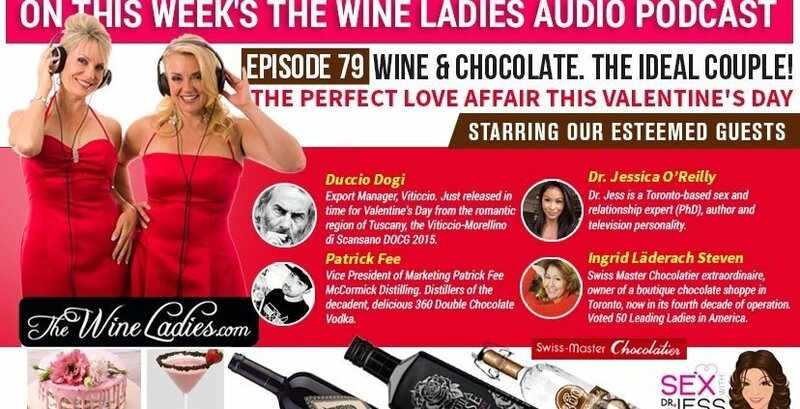 As lovers of anything having to do with the coco bean, this vodka, the 360 Double Chocolate Vodka produced by McCormick Distilling is the best! 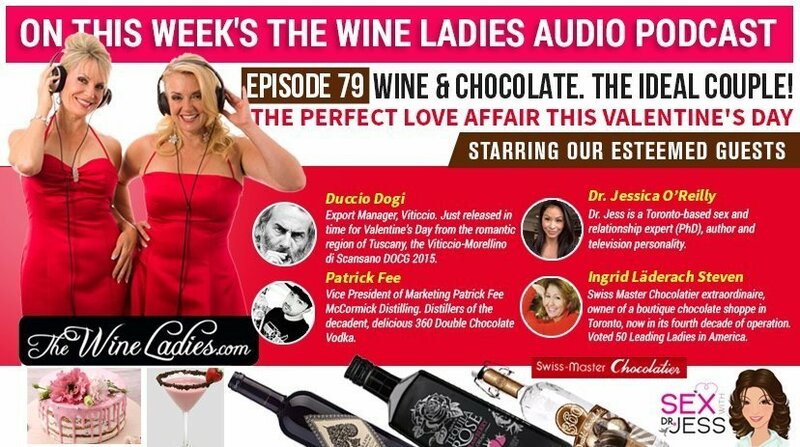 “The planets first eco-friendly vodka” is not only delish but there’s a lot going on here to feel good about and are excited to share with you. And once again this year, The Wine Ladies will be hosting several chocolate and beverage tastings at the 5th Annual Luxury Chocolate Show over at Roy Thomson Hall. 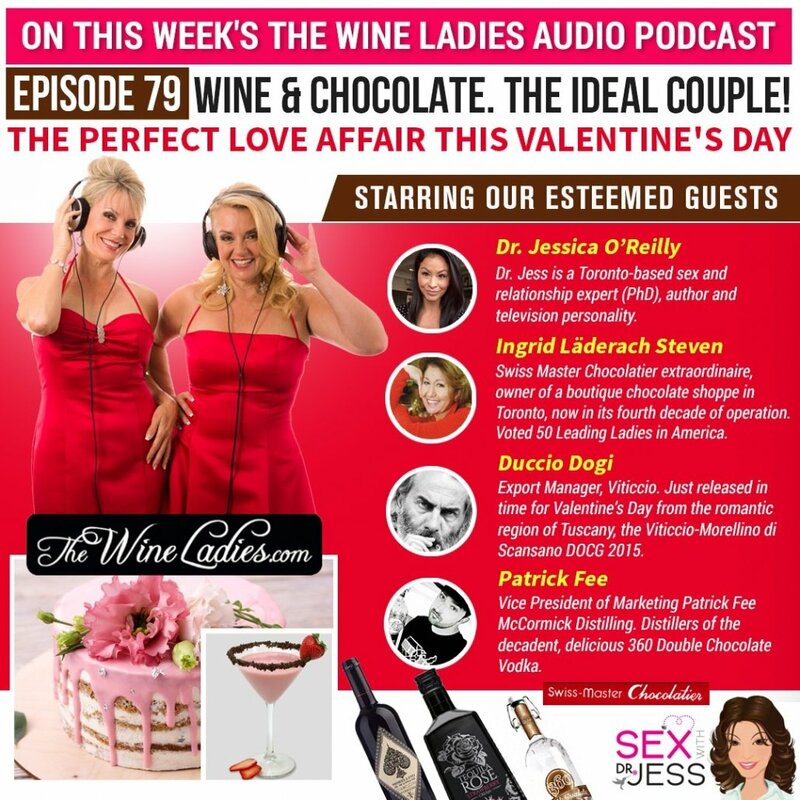 In preparing for the show we were recently introduced to a couple of really delicious unusual “chocolate infused” beverages. 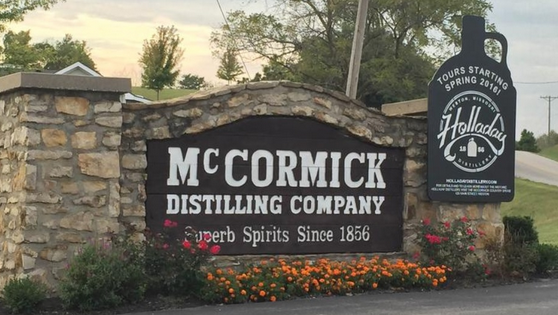 We would love to share with you including a product of a unique chocolate vodka, 360 Double Chocolate Vodka from McCormick Distilling . As well as a delectable award winning chocolate beer, Young’s Double Chocolate Stout, all paired with one of our faves, BRIX chocolate. 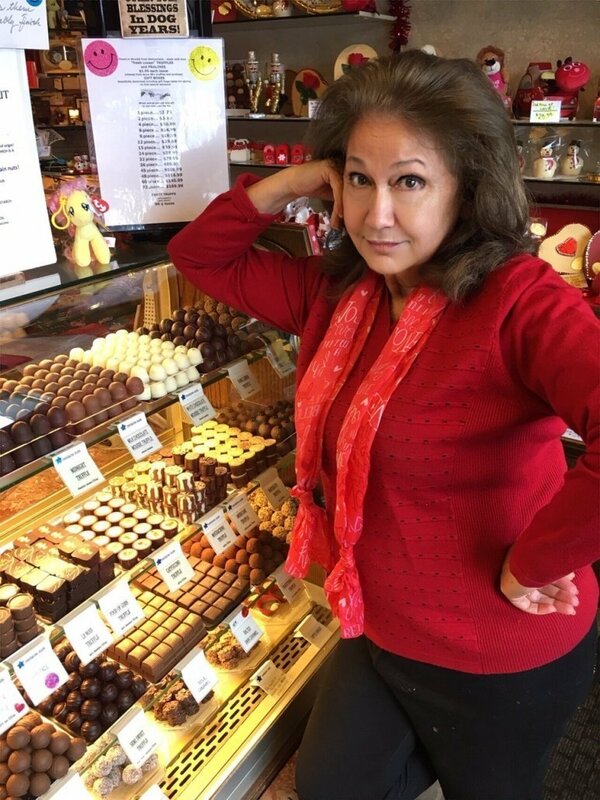 Join us for 3 special Wine, Spirit, Beer and Chocolate seminars Sunday, Nov 8th, 2015 at 1:00pm, 2:30pm & 4:00pm. 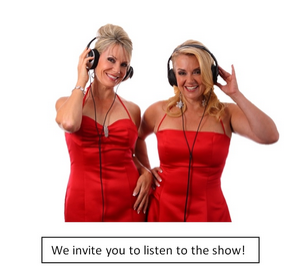 Get your ticket on site at the show. 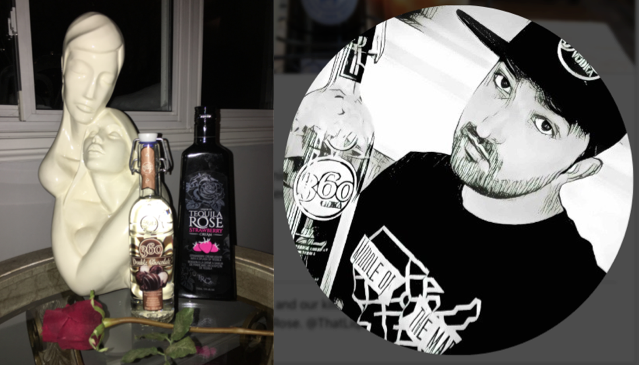 Next, we welcome ow to the show Patrick Fee.Patrick is with McCormick Distilling,he is the Creative and Design Manager.Here to tell us all about 360 Double Chocolate Vodka and 360 Vodka the brand. 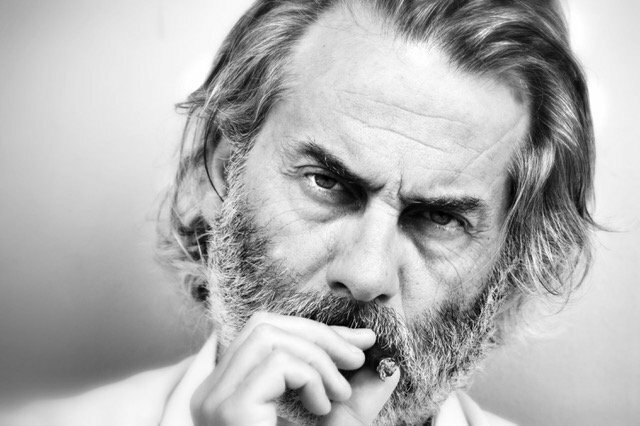 Listen to Patrick Fee at 23:50 minutes in the show. 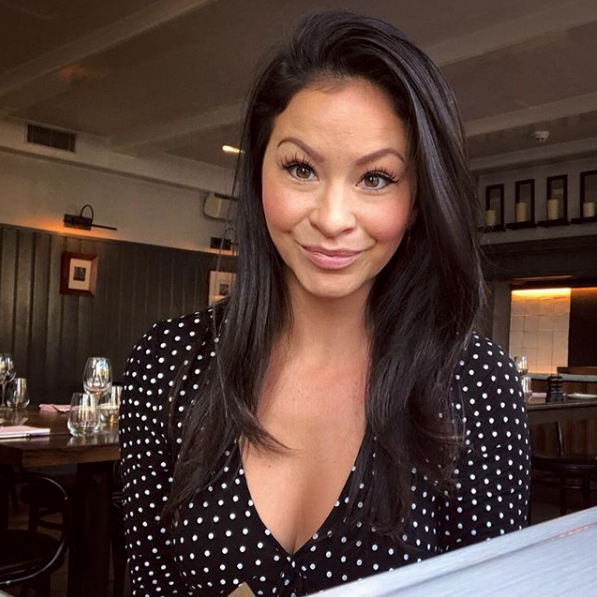 https://www.thewineladies.com/wp-content/uploads/2015/11/images_360vodkalogo.png 253 546 Susanne Seelig-Mense https://www.thewineladies.com/wp-content/uploads/2017/08/WineLadiesLogoTransparent.png Susanne Seelig-Mense2015-11-05 12:59:482018-03-23 09:33:32360 Double Chocolate Vodka the planets,first eco-friendly vodka.